Books That Heal Kids: Book Review: Let's Have a Dog Party! 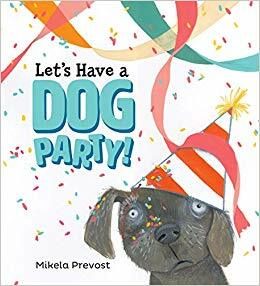 Book Review: Let's Have a Dog Party! From the Book Jacket: To celebrate Frank's birthday, Kate throws him a party with all her favorite things: lots of friends, dancing in circles, loud singing, and sparkly confetti everywhere. But best friends don't always have the same taste in parties. Frank prefers quiet, sun-drenched naps on his favorite rug. So he hides. Kate must find a way to bring Frank back to the party - on his own terms. A story that encourages empathy and the art of listening. Why It's On My Bookshelf: This has been such a help with the students at my school who are learning about self-regulation and how their behavior impacts others. If you like to teach the zones of regulation this is an awesome book to add to your lessons. Let's Have a Dog Party is a teaches kids the importance of recognizing and understanding others emotions. Frank is completely overwhelmed by the energy and excitement of the children. One of the things the kids in the story are not immediately picking up on are the social cues that Frank is giving through his body language. Finally, a girl named Kate realizes she needs to take a gentle quieter approach to Frank to help him feel comfortable and safe. This was a really good teaching moment for a small group I am working with. There are many different ways you can use this book with your students....self-regulation, personal space, zones of regulation, voice levels, empathy, and being a social thinker. I highly recommend this one. It's a great read with awesome illustrations to help teach these important social skills.